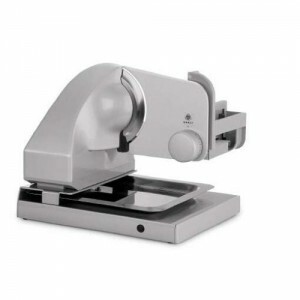 We have a great range of professional food slicers here at foodslicers.org.uk as well as ones for home use . (Use the tabs at the top of this page to see our full range of home and professional products). Professional food slicers make life easier and quicker in a restaurants, cafes or other catering establishments, they are much more study and robust for the job in hand. Easy to use the food slicer helps you to get every single portion out of your produce. Food slicers are perfect for making all your portions the same size, thickness and weight, which in turn helps your profit margins. Perfect for slicing cooked meats, vegetables, fresh bread, salads, salami and much more. You’ll wonder how you ever did without one once you have purchased a food slicer because nothing is left to chance, if you have a 5 kilo ham joint and want 100g portions you’ll get 50 portions every time!